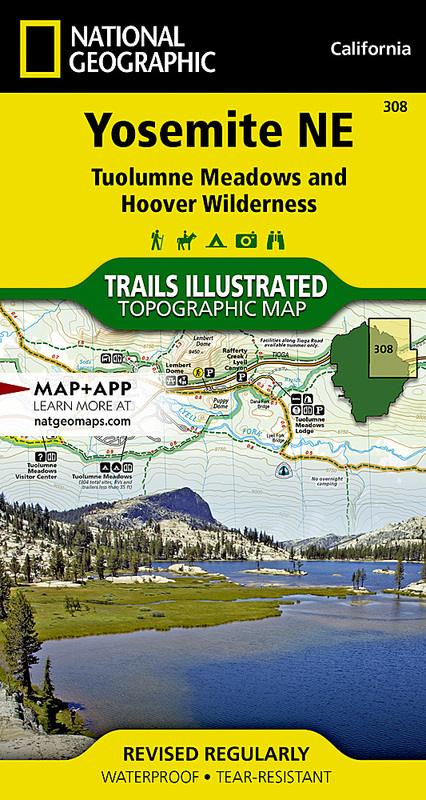 National Geographic's Trails Illustrated map of Yosemite NE: Tuolumne Meadows and Hoover Wilderness is designed to meet the needs of outdoor enthusiasts by combining valuable information with unmatched detail of this magnificent region of the park. Expertly researched and created in partnership with local land management agencies, this map features key points of interest including Twin Lakes, Tuolumne River, Grand Canyon of the Tuolumne, and portions of Ansel Adams Wilderness, Mono Basin National Forest Scenic Area, and Yosemite Wilderness. With miles of mapped trails including portions of the Pacific Crest and John Muir trails, this map can guide you off the beaten path and back again in some of the most breathtaking scenery in the Sierras. Trail mileage between intersections will help you choose the path that's right for you. Camping, hiking, wilderness permit, and safety information is included to help guide you in enjoying all the park has to offer. The map base includes contour lines and elevations for summits, passes, and many lakes. Recreation features are clearly marked, including campgrounds, picnic areas, trailheads, horse stables, ski areas, and more. Other features found on this map include: Ansel Adams Wilderness, Excelsior Mountain, Hoover Wilderness, Inyo National Forest, Matterhorn Peak, Mount Dana, Tioga Pass, Toiyabe National Forest, Yosemite National Park.